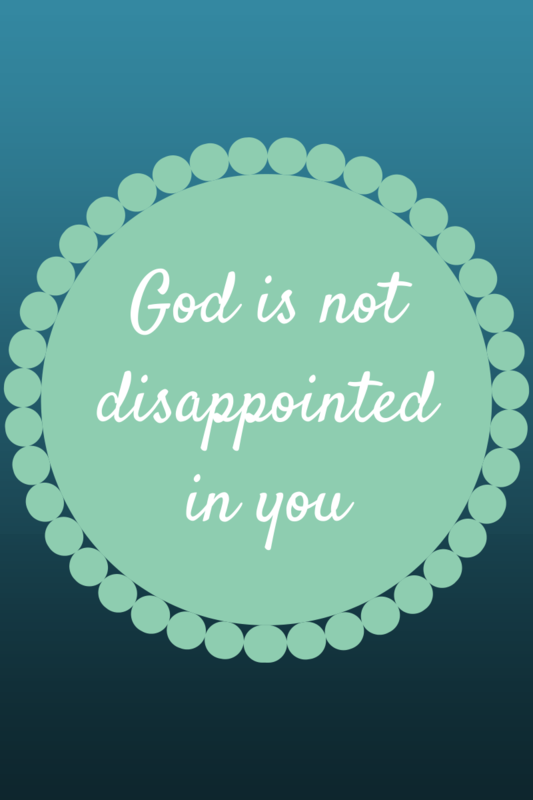 For far too long I felt like I was a huge disappointment to God, that I was constantly letting Him down. I grew up with three brothers who always picked on me, not that I am blaming them for my disfunction. I just always felt like a screw-up. I was anything but graceful. I have so many scars on my knees from constantly falling down, that a guy in college asked me if I’d ever had knee surgery! I chipped my teeth, broke my arm, busted my lip and head on various occasions. I'm sure I kept my mother on her knees! God declares us as righteous, not because of what we have done, but because of what Jesus has done for us on the cross. When God looks at us, He sees us through the blood of Jesus. He did this out of love for us, not because of anything we did to earn it. Not only is God not disappointed in us, we are pleasing to Him. Have you ever had the thought, "God loves me, but I'm pretty sure He doesn't like me." Well, there is no Scripture to back up that line of thinking. You're believing a lie. Sorry to sound so harsh - it's just the truth! Ephesians 1:5 says, "God decided in advance to adopt us into His own family by bringing us to Himself through Jesus Christ. This is what He wanted to do, and it gave Him great pleasure." God takes pleasure in being in relationship with you. He takes pleasure in calling you His own. What an amazing concept. Reconcile means to restore a friendship, to cause people to become friendly again after an argument or disagreement. God went through great lengths to restore His relationship with mankind. God is not mad at you and He is not holding your sins against you. Receive the Father's love - that requires faith! A timely message that so many need to hear! I'm going to share this post all over the place. Thank you, Bonita. It's such good news! Love you!